The writing in this book most definitely lives up to the stunning cover of The Bone Witch. I had a bit of apprehension prior to beginning this story because I saw a lot of DNFs due to slow pacing. And the pace is slow at times… but so what? This is a book that is well worth the effort put in by the reader. In the present, a bard requests Tea’s story and the reason for her exile. Tea’s story takes the reader into the past, to the day she accidentally raised her brother from the dead, setting her on her path to become a dark asha. Told in both past and present narratives, there might not be a heap of action and adrenaline rushes; but there is a unique and magic-filled plot. I love a book that I can consume in one sitting, but there’s a lot to be said for a book you read in small increments. Tea’s story is richly detailed; and yes, sometimes that much detail can be overwhelming, but I can’t say it was all unnecessary. It painted a picture that was captivating and beautiful. This book may not be for everyone, but I’m happy I read it. It’s a unique story with solid world building and gorgeous writing. I’m definitely curious to see what comes next. 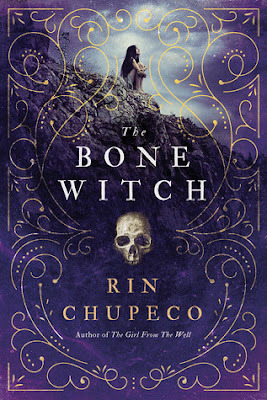 While The Bone Witch is not a thrill ride or a book to be devoured in just a few hours… it is an intriguing story and one to be savored. Sometimes a slow burn is just what you need. You have me so intrigued by this one Wifey. Great review! That cover is SO BEAUTIFUL. I'm glad to hear the writing measures up to it. I'm super interested in this one, I need to try it! !